"In this surprisingly timely book, Stephen John Mack examines Whitman’s particular and fascinating brand of patriotism: his far-reaching vision of democracy. For Whitman, loyalty to America was loyalty to democracy. Since the idea that democracy is not just a political process but a social and cultural process as well is associated with American pragmatism, Mack relies on the pragmatic tradition of Emerson, James, Dewey, Mead, and Rorty to demonstrate the ways in which Whitman resides in this tradition. Mack analyzes Whitman’s democratic vision both in its parts and as a whole; he also describes the ways in which Whitman’s vision evolved throughout his career. He argues that Whitman initially viewed democratic values such as individual liberty and democratic processes such as collective decision-making as fundamental, organic principles, free and unregulated. But throughout the 1860s and 1870s Whitman came to realize that democracy entailed processes of human agency that are more deliberate and less natural—that human destiny is largely the product of human effort, and a truly humane society can be shaped only by intelligent human efforts to govern the forces that would otherwise govern us. Mack describes the foundation of Whitman's democracy as found in the 1855 and 1856 editions of Leaves of Grass, examines the ways in which Whitman's 1859 sexual crisis and the Civil War transformed his democratic poetics in "Sea Drift," "Calamus," Drum-Taps, and Sequel to Drum Taps, and explores Whitman's mature vision in Democratic Vistas, concluding with observations on its moral and political implications today. Throughout, he illuminates Whitman's great achievement—learning that a full appreciation for the complexities of human life meant understanding that liberty can take many and conflicting forms—and allows us to contemplate the relevance of that achievement at the beginning of the twenty-first century." 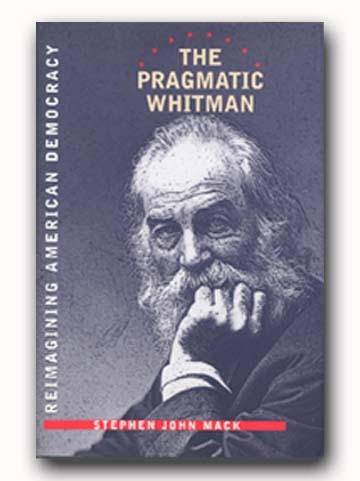 "Stephen John Mack's The Pragmatic Whitman: Reimagining American Democracy (Iowa), the most thoroughly informed and original philosophical reading of Whitman to appear in decades, is 'pragmatic' in at least three ways—thematic, historical, and methodological. Thematically, Mack develops the premise introduced by Richard Rorty in Achieving Our Country that Whitman shares with John Dewey a vision of democracy as a 'civic religion' in America, a profoundly secularist and progressive perspective that nevertheless incorporates mythic and even mystical elements and also takes a realistic approach to such national tragedies as war and poverty. Historically, Mack positions Whitman as a key figure in the lineage of American pragmatism that runs from Emerson to Dewey and his followers in a relatively straight line of descent. Methodologically, Mack's own pragmatism urges a productive look at not only what Whitman says directly about poetics and politics but also what he does in his poems, his poetic and political practice. Mack's primary originality consists in the treatment of Whitman's language experiment as outwardly positivistic but deeply pragmatic in its 'aggressive reinterpretation' of ancient texts and mythologies, his conception of the universe as still 'in the act of becoming,' his interpretation of democracy as an ongoing reinvention of the social world (dramatized in the poetic acts of Leaves of Grass and grounded in the natural law that denies special distinctions among living beings), his 'metaphysics of time' that reconciles key paradoxes in the idea of constitutional democracy, and the movement from a Jacksonian emphasis on human freedom to a 'mature' (post-Civil War) political outlook that emphasizes the 'cooperation of free agents bound together by a shared allegiance to the tenants of a democratic culture.' The most controversial views of the book, along with the suggestion that Whitman got better as a poet and thinker after the Civil War (which reverses the standard view), include the naturalization of Whitman's concept of the soul (on the model of George Herbert Mead) and the emphasis on the pragmatism of Dewey (arguably the coldest of the pragmatists) rather than that of James, Royce, or even Peirce."